The Lil Divas love to draw. They each have their own special drawing pads/books where they doodle, draw, write and create to their hearts content. I love sitting and looking through these books every now and then. It is amazing to peek at the things they sit and write or draw. Keeping everything contained in a special notebook like this is also a great way to see how their drawings or art evolve over time. The Littlest Diva is all about flowers, rainbows, butterflies, trees, grass, peaceful scenery and the words she can spell by heart a few of her favorites being mom, dad and love. Don't you just love it when they are that age where they want to write and they are sounding things out on their own? Creative spelling is my favorite - so fun to decipher what they are writing. The only problem we often have is that the Littlest Diva gets super frustrated when she can't draw things well enough to match the elaborate picture/vision she has in her head. The Oldest Diva is definitely our resident artist. She takes her drawings, or "pictures" as she calls them, very seriously. It's not uncommon to find her bent over her book for long periods of time as she draws picture after picture of girls in various dresses (future fashion artist or clothing designer, perhaps? ), places we have been, things se sees, etc. I love how she finds inspiration in everything. When I was contacted by Barker Creek regarding their award winning Draw Write Now series of books, I knew it was something the Lil Divas would want to try. 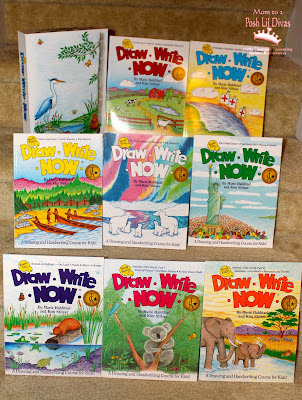 Barker Creek generously sent us their amazing Draw Write Now boxed set. They are geared for children in K-3rd grade (ages 5-9 years old). The boxed set includes all 8 books in the Draw Write Now series. Each full color book is 64 pages and contains 21 drawing and writing lessons. Each drawing lesson has step-by-step instructions, with the newest steps being in red. This makes them very easy to follow, since they stand out against the black drawings. There is a wide range of topics which are covered by the 8 books in the series. Book One covers the farm, kids & critters and storybook characters. It is also the easiest of the series and a great place for beginners to start. I am looking forward to using Book 2 & 3 this month as we discuss fall and Thanksgiving. Book Two deals with Christopher Columbus, autumn harvest and the weather. Book Three introduces Native Americans, North America and the Pilgrims. Book Four is my personal favorite as it deals with the polar regions, the Arctic and the Antarctic (I love polar bears!). I will be using it when we discuss polar animals in winter. Book Five, the most difficult of the series, deals with the United States, from sea to sea and moving forward - this was the Oldest Divas favorite book so far. The Littlest Diva was drawn to Book Six which deals with animal habitats. Book Seven introduces animals of the world from forests. Book Eight introduces animals of the world from the Savannah, Grasslands, Mountains and Deserts. These books would be great in the classroom. How wonderful would it be to enrich science and social studies lessons with art? The Oldest Diva (6.5+ years) is really into historical facts about the United States, our US Presidents and of course famous landmarks. It was not a surprise to me that she was instantly drawn to Book Five which deals with the United States, even though it is the most challenging book of the series. 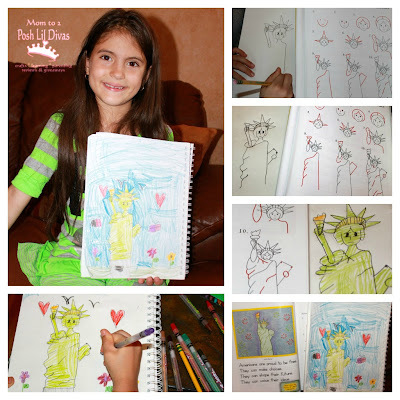 She was determined to learn how to draw the Statue of Liberty - her absolute favorite US landmark. The Oldest Diva followed the step-by-step instructions and did a great job of recreating the Statue of Liberty on her own. She added some personal touches to make the picture her own and was so proud of her finished product. I have to admit I was pretty amazed by how good it looked myself and I liked that she used the book as a guide but she didn't let it keep her from doing things the way she liked as far as her own artwork. 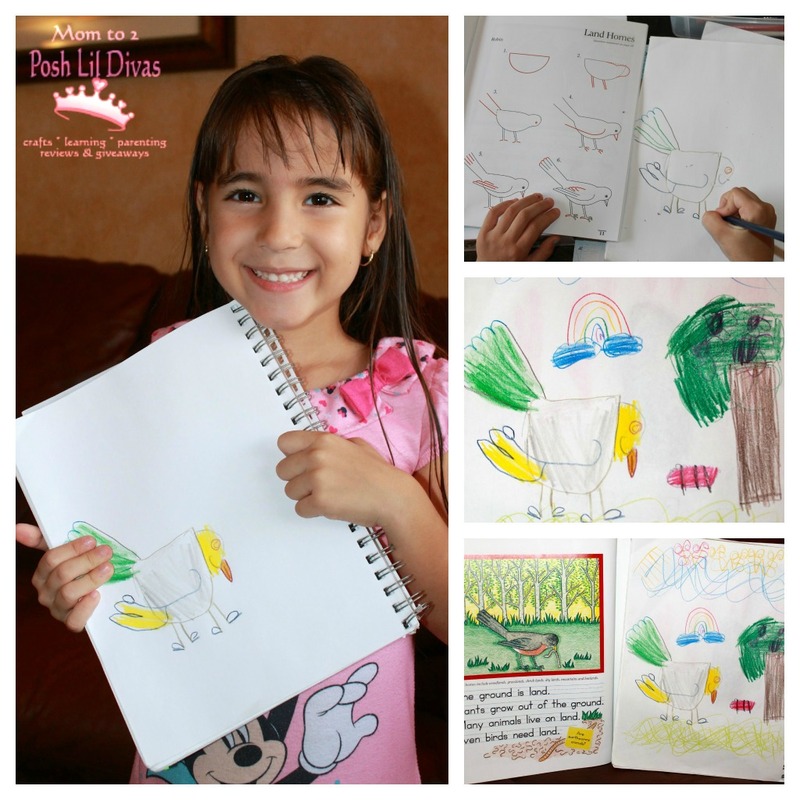 The Littlest Diva (age 5) who loves all things nature opted to draw a bird from Book Seven. She was so excited to finally be able to make something that really looked like a bird - she always draws those little m's flying in the sky that we all know as birds, hehe. She too added details to her picture to make it her own, including grass, the sun, butterflies, an apple tree, a rainbow and a nice fat worm for her bird to eat. Both girls spent a great deal of time creating their drawings with these books as a guide and making them their own. Aren't they fantastic? Over time, they have worked on quite a few of the lessons in the series. They have been drawing elephants, giraffes and pilgrims to name a few. I am not ashamed to admit that even this mama has gotten in on the fun and used the books to draw my favorite animals - a polar bear and a giraffe. I felt like quite the artist myself . I can honestly say that these books are super easy to follow (my 5 year old is able to use them independently), the series has a wide variety of topics covered and as a teacher i love that each drawing lesson includes 4 sentences/facts about what is being drawn further extending the drawing into a writing lesson. Barker Creek also offers a wide range of additional products as well. To learn more about them and their products visit their website or become a fan of their Facebook page. Now, I am super excited to announce that you can WIN your very own Draw Write NOW boxed set like the one featured above! How awesome is that? The fab people over at Barker Creek are providing one of these boxed sets ( a $99.99 value!) to one lucky Mom to 2 Posh Lil Divas (US only) reader. Click on the Rafflecopter form below for all the how to's and please read our official sweepstakes/giveaway rules & info before entering. Disclosure- I received promotional products to facilitate this review and giveaway. The experiences and opinions shared are my own. Please keep in mind that your experiences may differ. I'd say 6, 7, and 8 because kids seem to really love animals. Yay!! What a great Giveaway! I would say that I am most excited about book one because my little man is very into all things farm related... I think it comes with growing up on a farm. I like book 5 for my older girls, 12 & 14 years old. Book 1 for my 4 year old daughter and book 4 for my 7 year old son. Actually I really like them all! Very cool!! I never heard of these books before Bernie... They all look awesome. I'd love to win one but do you know if they sell them at Walmart, Target, etc? I think I'd have to just start at the beginning...book 1. My daughter loves to draw and write her own stories. Any of these would be perfect. Book 1 would be a good place to start. My daughter loves to draw and could use some good direction and lessons, as I am not artistic. Any books with animals in them would be great. All of the books look amazing! I think my 5 year old daughter would LOVE them all! My grandchildren love to draw,these books would be great! With Thanksgiving being around the corner I believe Book Five would be a great place to start. Thanks for this giveaway. What a great set! I would love to win because book 2,3 and 5 would correlate to the current curriulem I teaching my second gradeer son and my daughter who is six would love the animal books, she is the distinguished artist in this house. I hope I win, but even if I don't thank you for introducing me to a great art curriculem. I love finding new ways to teach! Thanks for this giveaway! My kids would love the first book because they're always playing with farm animal toys and love various little critters. I would LOVE to use book 5 with our atlas! I'm excited about Book 1. My kids and I make up stories about critters and such on a daily basis, and we would love to be able to illustrate our little stories. Our 7 year old would LOVE this - he is always drawing and being crafty! My kids would enjoy book 8. They love drawing animals. My son would enjoy book 8 since he loves animals. My kids would like any of the books but my triplets love penguins the most. Thanks! I loved using these when I taught 1st grade! I have three kids of my own that would love to use these books! These look awesome! I like Book Eight and Book One the best! I'm sure they are all wonderful! My Sons ages 6 and 7 would LOVE this. My 6 year old spends a lot of time drawling, he also call his drawlings, "pictures". And this could help my 7 year old with drawling. He would be SO happy to draw something better than a stick figure with hair ;) I know they would enjoy all of the books, but book 7 is one we would all have some fun with. I really enjoy drawling with my boys, it's kind of relaxing. Any and all of them. The girls all like different things, but given their enjoyment of making stories I guess I'd have to narrow it down to Book 1 for the storybook characters and animals. LOVE this giveaway...thank you! I would love to have The United States, From Sea to Sea, and Moving Forward Book for my second grader but they are all awesome! I love all of them, but I think Book One, with the farm would be great for the area we live in. Of course, the Native American/Pilgrim book would be great for this time of year. They all look fantastic! We would love to start with book 5. We are studying America now so I think that would be a great book to start with! Because its November, I'm excited about the book with the fall themed drawings! I think my daughter would enjoy book 5. I'm a sucker for polar bears too, so book 4 it is for me! I teach grades 1&2 and have students from 5-7 (soon to be 6-8).... I was not a great artist growing up and work hard at giving my students the skills and the confidence they need to be 9and feel!) successful. PS ~ thanks Bern for another great 'hook up'!! I am most excited to try Book 1. Both my kids love to draw and it would be great to give them something a little more structured and simple to start out with. This would be great for my boys. I would love to try book one about animals. My littles would love any of the animal books! 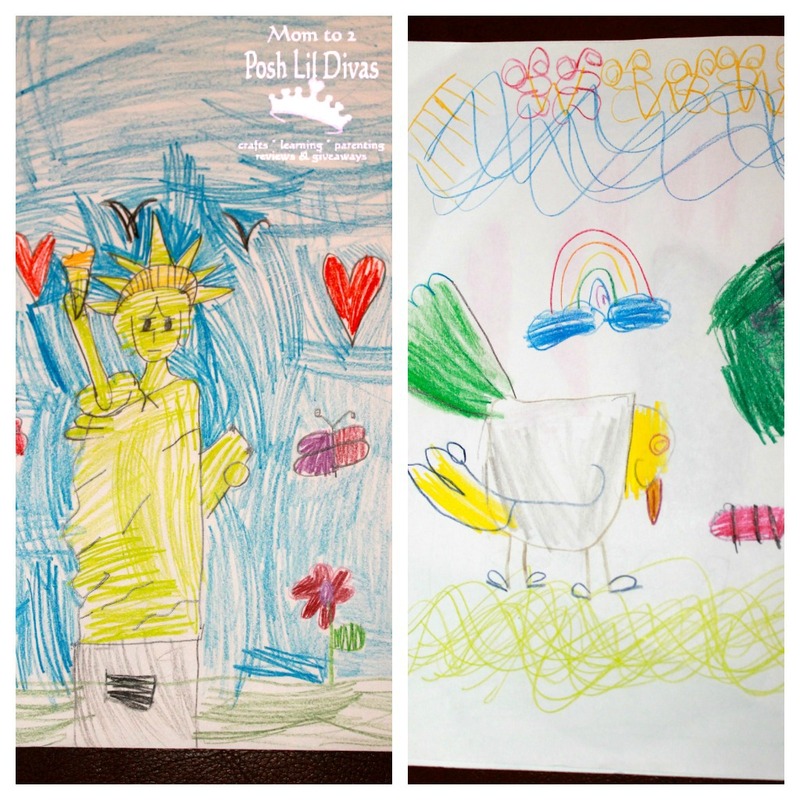 My girls love to draw...we would love these!! I would like the On the Farm one. We would most enjoy Book 5. We are doing a lot of American history and themes this year and that would be a wonderful addition! All of them would be awesome! However the best one would have to be learning to dry the safari animals! As an occupational therapist I love the concept of the drawing instruction with the writing! I just recently saw these wonderful books on a list for our Homeschool Co-op. I would love to incorporate them in our lessons. As a Kindergarten teacher I vote for number 1. I think my daughter would enjoy book 1 she is really into art ! My daughter would love book 5 . We are studying early American history right now and she loves it and can't find enough books about American history. She would love to draw about it also. I have 3 children and they would love all these books. We have worked with one of them (book #1) and my son loved it! I have 4 kids, but my oldest has a true love for drawing. I can imagine he would love all these but I'm thinking he would do great with #1. Knowing the interests of my little artist, he'd be starting with book 4. I would love to get book one the most. We just visited a farm, and my daughter loves all kinds animals so she would love it! My daughters would probably most love the farm animal book. My daughter would love these especially book 7; animals are her passion. My daughter loves to draw and write. I think any of them would be perfect for her. I like book 7. My kids would so love all of these. I think they would be trying out book 4 about the Polor Bears. They love Polor Bears right now. My son would love the farm book. My daughter would love any of the animal books. My kids are really into animals, so I think book one, of the farm animals, would be great! They all look fabulous! I know my girls would love the polar animals one! My girls would LOVE for me to win this set of Draw Write Now! my kids would love these so much! oh, and my kids would love the nature one the best! My girls LOVE anything with elephants! That'd be a huge hit! They all look wonderful however my little one is in love with the farm so I'd have to say Book 1. My girls would love drawing, these would be perfect! 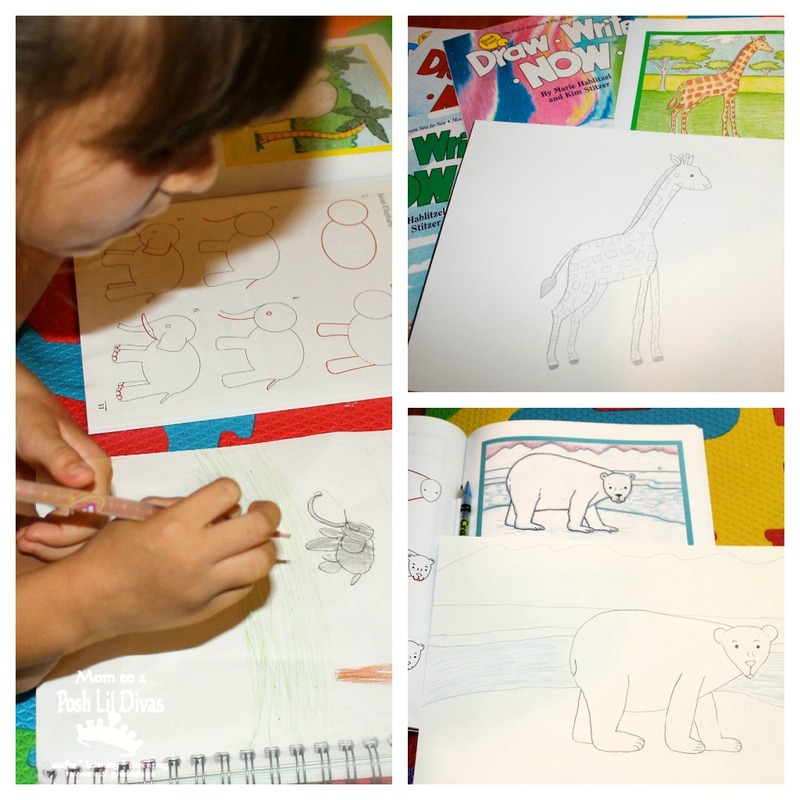 They love going to the farm, and what could be better than learning to draw all the animals! How fun! I was just saying how I wished they had an after school art program at our elementary school--what a great way to draw at home! My daughter would probably love book 7 She likes Nature. I would love to try book 7 too. My kids love animals. I would like Book 8- Animals of the World part II because my kids really enjoy anything with animals. 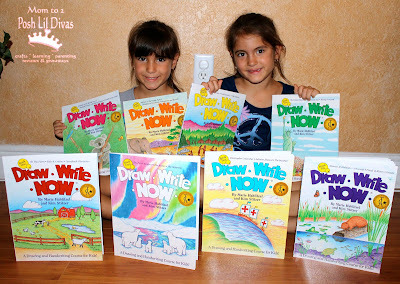 My kids are young, so they would like to try the Draw Write Now Book 1: On the Farm -Kids and Critters-Storybook Characters. I think they are all great. My students would love all of them. I am most interested in seeing what they can draw with book 5. I am anxious to try Book 3, as we are currently studying Native Americans & Pilgrims! I like them all but book five seems interesting!